Note: The sentences in italics are quoted from the book by Gary Renard, The Lifetimes When Jesus and Buddha Knew Each Other. I have read the The Lifetimes When Jesus and Buddha Knew Each Other twice. The first time was a quick read of the Kindle ebook which I had bought on the day the book was released. The second read was when the hardback copy arrived from Amazon. I find that I get the messages at a deeper level each time I re-read the books by Gary Renard. Anyway, there are 3 major themes in Gary Renard’s fourth book for me personally. 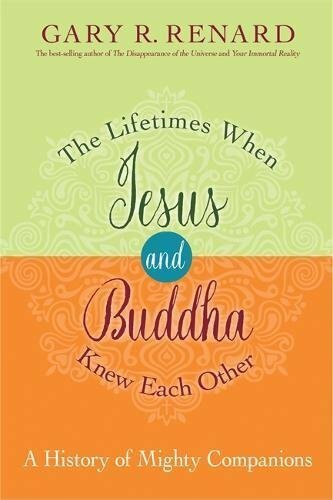 In the first half of the book, the ascended masters aka manifestations of the Holy Spirit, Arten and Pursah, were sharing with Gary (and us) the six most important lifetimes (also the last few) where Jesus and Buddha had spent together. There are a number of surprises revealed throughout the book. Jesus and Buddha knew each other much more closely than we have suspected. They were at times male and also female in other lifetimes. They had been buddies, cousins, father and son, and oh yes, romantic partners too. In their final lifetimes together, they had advanced spiritually together and eventually became enlightened. But the main purpose of Arten and Pursah sharing the stories of Jesus and Buddha is to remind us that there appears to be a ladder to enlightenment. This illusory ladder also applies to the rest of us. As explained in Gary’s first book Disappearance of the Universe, there are 4 attitudes of learning or we can think of them as phases as we awaken: dualism, semidualism, nondualism and pure nondualism. Dualism is how 99.9 percent of all people think. It is the experience of consciousness, which is the domain of the ego. In order to have consciousness, you have to have something else to be conscious of. So it’s not the oneness of spirit. You think the world is outside of you, and it’s real, period. Then you have semidualism, which is a move in the direction of spirit and slowly away from dualism. Along with the attitude of semidualism would come gentler beliefs, like the idea that God is love. That idea might start to make you think and ask questions. For example, if God is really love, can He also be hateful? Nondualism says there’s no such thing as separation, and anything that appears to be separate is not real. The projection is undone in your mind and you go from being at a position of effect to a position of cause. Now you’re no longer the dream, but the dreamer. And the dream is not dreamed by somebody else. There is nobody else. Nondualism is non-twoness. There is only oneness and only one reality. Some great teachers like Lao Tzu knew and taught nondualism. However, he did not acknowledge the world of God in his lifetime as Lao Tzu. Pure nondualism was the state of being for Jesus during his final lifetime. The reason it’s pure is that it acknowledges God as the only source and the only reality. Yes, there may appear to be two separate worlds, the world of God and the world of man, but only the world of God is true, and nothing else is true. It’s rare for a person to be able to acknowledge and accept this, because it means the relinquishment of any form of personal identity, whether body or soul, now and forever. Another purpose of Arten and Pursah sharing the lifetimes of Jesus and Buddha is to encourage us along this journey of awakening to love. From their stories and examples, we realize that they are no different from us and Jesus and Buddha have had their fair share of trials and tribulations. If they could do it, so can we. The biggest mistake A Course in Miracles students as well as other spiritual students make when it comes to forgiveness is that they don’t go all the way with it. Their forgiveness is too limited. This observation was also in Gary’s third book, Love has Forgotten No One, where Arten and Pursah had encouraged us to look beyond the body and see that the other person is everything–all of it. As we “see” another, we “see” ourselves. As Gary had observed in his travels and workshops, a lot of students seem to have a big problem going all the way with that. He would say that according to the Course, the absolute truth is this: God Is. And most students don’t have much of a problem with that. But then if you tell them, nothing else is, you can see the resistance on a lot of their faces. They can get the truth of God, but they can’t get that absolutely nothing about the world and their lives is real. This brings back to my own experience and observation that we cannot try to skip the tough part and take the shortcuts in awakening. We have to do the forgiveness, bit by bit, akin to peeling the layers of the onion off, until we are able to remove all the obstacles to what we really are — love. This is related to our earlier theme that we have an illusory “ladder” to climb to reach enlightenment and thus the Course’s explanation that we have to be awakened gently. Arten and Pursah have been uncompromising since Gary’s first book that their physical manifestations to Gary have been to push us beyond procrastination and help us to awaken faster. An interesting personal revelation for Gary in this series of visits from Arten and Pursah is that both he and Cindy can actually be enlightened in this lifetime as Gary and Cindy. They don’t have to wait until their next and final lifetimes as Pursah and Arten, which was revealed to them in earlier books. This is because although the script has been written, we are really projecting from our mind and watching these illusory lifetimes as “movies”. We are not really here. We are dreaming and reviewing the movies in our mind as bodies and seemingly having these life experiences. When we make a choice to interpret the world with the Holy Spirit — our only choice being that of looking at something with the Holy Spirit (right-mindedness) or ego (wrong-mindedness), the Holy Spirit can possibly change or collapse the timelines as we complete our forgiveness lessons. Gary and Cindy could potentially complete all their forgiveness opportunities and be enlightened in this lifetime. So could the rest of us if we are determined enough. Even if it doesn’t happen yet, our in-between life and next illusory lifetime would still be easier because of all the forgiveness we have done now. After hearing this, I am more determined than ever to be vigilant of the ego and complete all my forgiveness lessons in this lifetime. Gary and Cindy, I am with you! A good Course student is a bad Course student who forgives himself.